Parks are important assets for everyday participation. Our interviewees and ethnographies are revealing how people use parks for a range of reasons: to be together with family, to find new friends through taking part in sports, to encounter fresh air and nature, to hang out away from parents and siblings, or be alone but in a public space. In the rainy cities of Manchester and Salford as we approach Midsummer’s Day and the nights get longer, park life really takes off. There are community fun days in parks, endless football and cricket games, angling, book-reading, dog-walking and work lunch hours. Cheetham Hill, where this research has been taking place, is an area with an extremely diverse and relatively transient population, but a noticeable absence of community facilities that are inclusive of all communities. It has many community buildings associated with different ethnic and religious in-migration over the years, some of which are no longer used for worship but are still available for community use, and some which have seen more recent investment such as the Irish Heritage Centre and the Ukrainian Centre. But there are few spaces where these different communities can easily mix and share ‘neutral space’. Parks provides these kinds of spaces (when weather allows). 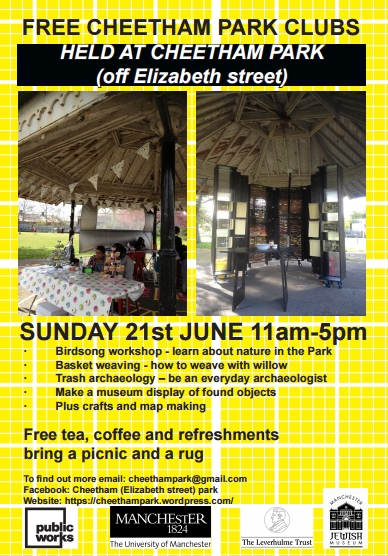 This midsummer in Cheetham Park, North Manchester, we are holding a number of activities on Saturday 20 and Sunday 21 June as part of the AHRC’s Connected Communities festival. These include outdoor workshops led by Leverhulme Trust artist-in-residence Torange Khonsari, who is working with the Manchester Jewish Museum and in the Park, and with University of Manchester Researchers-in-Residence, Jeni Allison and Luciana Lang. They are part of a longer programme of clubs and conversations which Torange has been involved with since 2012 and will build up to a Cheetham Park Birthday Day on September 20th when the Park celebrates its 130th anniversary. The Park, 10 minutes’ walk from the Jewish museum, and next to the site of a Jewish Hospital, holds a treasured place in many memories for local communities, and continues to be space which different user groups and individuals enjoy. These workshops and clubs are partly to facilitate some of the things that happen in any case in parks – noticing nature, coming together in the same space with different communities, spending time slowly and sociably. They are also to raise awareness of the importance of parks and their amenities – such as playground equipment, tennis and basketball courts, pitches and picnic tables, lawns and planting, bandstands and shelters – to local neighbourhoods, both now and historically. Our historical research on the beginnings of public parks in Manchester and Salford shows that they were established for civic improvement, to alleviate the conditions of working class life in the newly urbanised, industrialised cities, through access to nature, recreational space and entertainment and education. Throughout the twentieth century they were managed under local authorities’ administration, through Park Committees and Park Keepers, and also through subscription membership and self-organised activities such as the People’s Parliament in Queen’s Park, Manchester. They featured a range of different sports and physical recreation facilities and cultural programming, including music concerts, dances, art exhibitions and public lectures, and the politics and policies of their administration were the subject of public debate. These debates are resurfacing. Under austerity, as funding cuts continue to bear down on the capacities of local authorities and leisure trusts to manage and maintain public parks, with worse to come, parks and the benefits they provide to communities are under threat. As with other community assets, there has been an increased pressure to find different economic and management models for parks which pass the responsibility and cost of maintaining them to different stakeholder groups. Heritage Lottery Fund and NESTA’s Rethinking Parks programme recognises this need and is funding a number of pilot projects to explore how resources can be raised and managed to ensure that public spaces do not fall into private hands and remain accessible to communities. 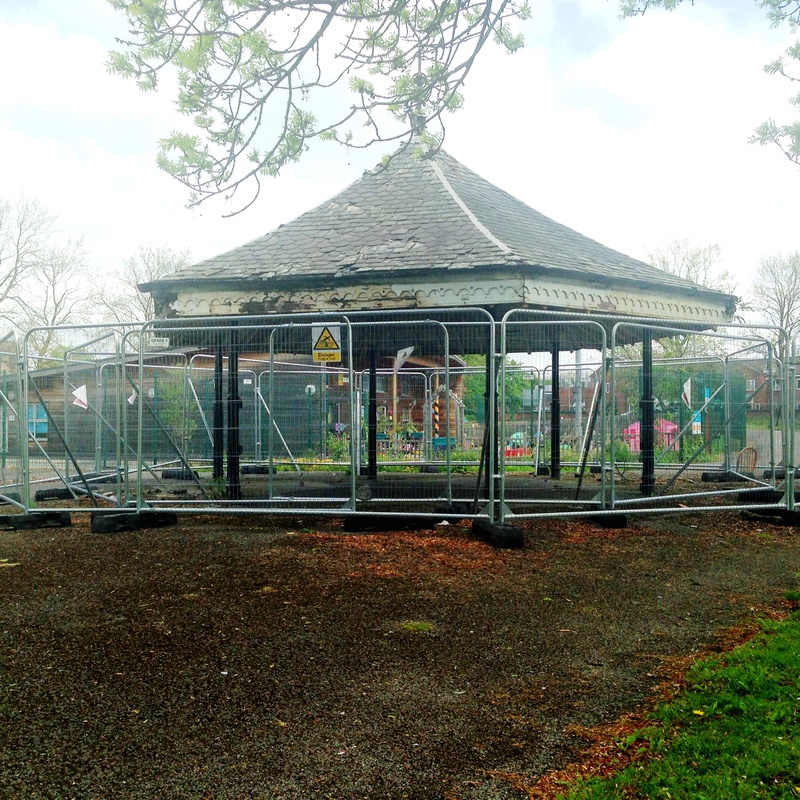 The clubs and activities in Cheetham Park aim to provide a space for communities to come together and explore their connections and memories to the Park and consider actions which will help maintain the asset and keep it open for community use. Developing the social infrastructure for sustainable community involvement and management of the Cheetham Park is a priority identified in the Cheetham Ward Neighbourhood plan, and there is much to learn from other activities in the two cities, including the activities of Friends’ Groups in Peel Park, Salford, and Wythenshawe Hall, Manchester, and the investment in the Cultural Park-Keeper as part of Whitworth Art Gallery’s impressive redevelopment. The project aims to bring wider expertise and stakeholders together and explore the possibilities for safeguarding Cheetham Park’s future. This entry was posted in UEP event by Abigail Gilmore. Bookmark the permalink.